June 8, 2010 - The most advanced aircraft in the history of the United States Navy made its inaugural flight on Sunday, assuring a future of long-range, first-day-of-the-war stealth striking capability from the Navy's big-deck carriers. The first Lockheed Martin F-35C Lightning II carrier variant took off from Naval Air Station Fort Worth Joint Reserve Base at 11:46 a.m. and logged a 57-minute flight. "I am thrilled the F-35C has attained this milestone," said Vice Adm. Thomas J. Kilcline, Commander of Naval Air Forces. "This flight marks the beginning of a new chapter in Naval Aviation. The mission systems in this aircraft will provide the Carrier Strike Group Commander with an unprecedented ability to counter a broad spectrum of threats and win in operational scenarios that our legacy aircraft cannot address. "As a long-range, stealthy, carrier-based aircraft, the F-35C will provide Naval Aviators a fifth-generation fighter with the most advanced technology possible to perform our nation's missions. I look forward to the F-35C's continued progress, and observing developmental flight testing at Patuxent River later this summer," Kilcline said. The F-35C is unique in its uncompromised carrier suitability, with a larger wing and control surfaces for safe, precise handling and low approach speeds to the carrier, excellent over-the-nose visibility, and additional structural strength for at-sea operations. The aircraft's stealth materials are designed to withstand harsh carrier conditions with minimal maintenance. "For the first time ever, and from now on, wherever on the world's oceans we position a 98,000-ton nuclear carrier, we can launch a long-range, lethal, stealth strike fighter with the ability to defeat the most sophisticated air defenses," said Tom Burbage, Lockheed Martin executive vice president and general manager of F-35 Program Integration. "Sunday's flight marks the beginning of the true introduction of a next-generation weapon system capable of providing joint, coalition striking power on Day One, from both land and sea bases." The mission was flown by Lockheed Martin Test Pilot Jeff Knowles, a retired Naval Aviator and test pilot who flew F-14As and F-14Ds operationally, and who served as chief test pilot on the F-117 stealth fighter program. The F-35 program has about 900 suppliers in 43 states, and directly and indirectly employs more than 130,000 people. Thousands more are employed in the F-35 partner countries, which have invested more than $4 billion in the project. Those countries are the United Kingdom, Italy, the Netherlands, Turkey, Canada, Australia, Denmark and Norway. The F-35 Lightning II 5th generation fighter combines advanced stealth with fighter speed and agility, fully fused sensor information, network-enabled operations and lower operational and support costs. 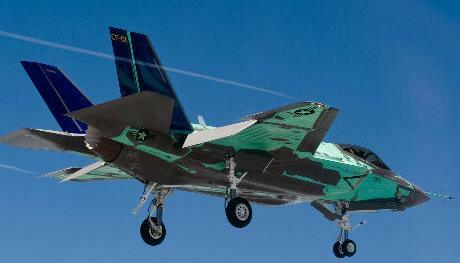 Lockheed Martin is developing the F-35 with principal industrial partners Northrop Grumman and BAE Systems. Two separate, interchangeable F-35 engines are under development: the Pratt & Whitney F135 and the GE Rolls-Royce Fighter Engine Team F136.